When you think of olive trees, you probably picture large, knotty trees filled with green or black fruit. 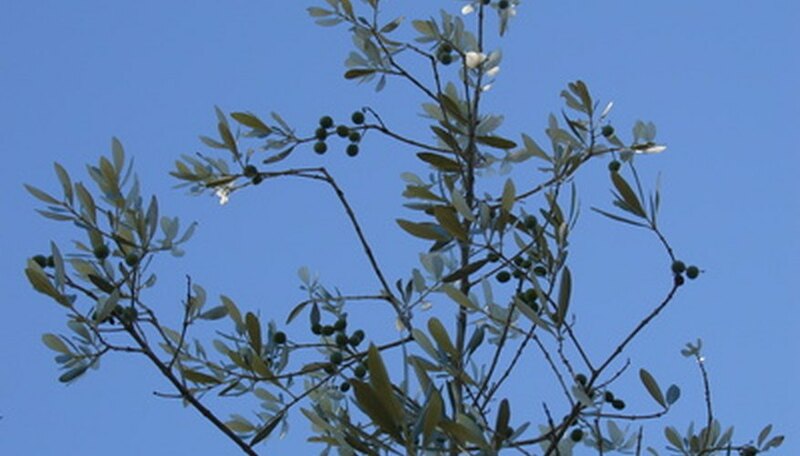 Olive trees are a difficult tree to grow in the United States. Although full-sized olive trees will grow well in zone 11, in zone 10 or cooler, the trees sustain damage and may be killed to the ground during a heavy freeze. For an ornamental shrub that is hardy to zone 8, dwarf olive trees such as Little Ollie provide a Mediterranean look and feel without the size or fruit. Select a location for your dwarf olive tree that is located in full sun and well-drained soil. Olive trees do not do well in poorly drained soil and may develop root rot. Test your soil by digging a quart-sized soil sample from the ground. Allow the soil to dry and then remove all debris with a shovel. Place the soil in a sterile plastic sandwich bag. Take the soil to your county extension service. Agents with the county extension service will send the soil to your nearest agricultural university testing facility. The testing facility will analyze the soil’s structure and pH, as well as make recommendations for amending your soil. Break up your soil with a rototiller to a depth of 12 inches. Spread soil amendments in a 4-inch-deep layer over your soil according to the recommendation made by the soil test. Olive trees tolerate a wide range of soils, but thrive best in loamy soil. Good soil amendments for olive trees include compost and peat moss to make the soil loamier and improve drainage, composted manure to add nutrients to the soil, and gypsum to break up clay soil. Olive trees do well in a wide range of soil pH from 5.5 to 8.5. To raise the pH of soil, add lime. To lower it, add sulfur. Dig a planting hole for your dwarf olive tree’s root ball that is twice as wide as the root ball, but no deeper. Place the tree in the hole and fill in the sides of the hole around the tree with soil. Water the tree to dislodge any air pockets and fill in with more soil. Water the tree with 1 inch of water per 1 square surface inch of surface around the tree’s root ball once every 10 days for the first year until the tree becomes established. Then gradually reduce your watering until you only water during drought conditions. Olive trees are naturally drought-tolerant, and will be able to get all of their watering needs met with rainwater. Fertilize your dwarf olive tree in spring by spreading a general-purpose, granulated fertilizer around the tree’s drip line in spring. Use amounts based on the fertilizer packaging recommendations. Fertilizer concentrations and use amounts vary among brands. You can grow dwarf olive trees in containers as a patio tree in any zone. In zone 7 or cooler, bring the tree indoors in winter to protect it from harsh cold weather. Dwarf olive trees may be clipped into hedge shapes or left to grow naturally. In their natural shape, dwarf olive trees resemble their larger parent olive trees, but do not bear fruit.